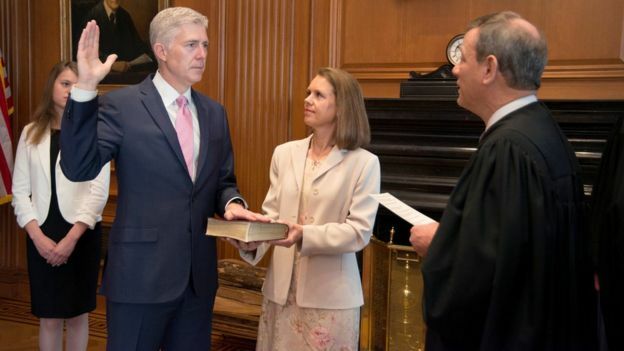 WASHINGTON — Neil M. Gorsuch was sworn in on Monday as the 113th justice of the Supreme Court, placing a devoted conservative in the seat once occupied by Justice Antonin Scalia and handing President Trump a victory in his push to shape the court for decades to come. Justice Gorsuch, 49, took his judicial oath in the White House Rose Garden with Mr. Trump looking on. It was the fulfillment of a vital campaign promise made by Mr. Trump — one that allayed the reservations of many Republican Party stalwarts, who were otherwise repelled by his candidacy — to make the appointment of a strict conservative to the Supreme Court a top priority. Justice Anthony M. Kennedy, 80, often a swing vote on the court, presided, a reminder that Justice Gorsuch’s ascendance may not be this president’s final chance to influence the direction of the high court. Justice Kennedy’s presence was symbolic personally for Justice Gorsuch, who served as a clerk for Justice Kennedy and considers him a mentor. It is the first time in the history of the Supreme Court that a sitting justice will serve with a justice who had been his clerk. About two hours before the Rose Garden ceremony, Chief Justice John G. Roberts Jr. administered a separate oath, the one given to all federal officials to support and defend the Constitution, to Justice Gorsuch in a private session at the Supreme Court. But the public event at the White House, which was attended by all eight other justices and several conservative activists, was an opportunity for Mr. Trump to wring maximum public credit from Justice Gorsuch’s confirmation. He showcased a rare domestic victory after a chaotic first few months in office marred by legal troubles over his travel ban, the failure of his effort to repeal the health care law and intense feuding inside his senior team. Mr. Trump called the occasion “momentous” and “historic,” noting that his power to appoint was among a president’s most important. The Rose Garden ceremony, on a sun-soaked spring day, recalled one just over a year ago in which President Barack Obama announced his selection of Judge Merrick B. Garland to succeed Justice Scalia. Senate Republicans quickly declared, however, that they would not consider Judge Garland’s nomination, saying the choice should belong to the next president. Justice Gorsuch’s confirmation process, too, was marred by an extraordinary degree of partisanship. After Democrats waged a filibuster against him, making it impossible to reach the 60 votes required to advance his nomination to a final vote, Republicans invoked the so-called nuclear option, lowering the threshold on Supreme Court nominations to a simple majority vote. Justice Gorsuch alluded to the intensity of the battle on Monday, as he thanked the many White House and Justice Department officials who “worked through so many late nights and long weeks” to get him confirmed. “I promise you that I will do all my powers permit to be a faithful servant of the Constitution and laws of this great nation,” he said. President Donald Trump has said Neil Gorsuch will be "truly great", as the Colorado judge took the oath to become a justice on the US Supreme Court. "And I got it done in the first 100 days," Mr Trump quipped at a ceremony in the White House Rose Garden. "You think that's easy?" Mr Gorsuch, who was sworn in by Justice Anthony Kennedy, becomes the 113th justice to serve on the high court. "I am humbled by the trust placed in me today," he said after taking the oath. "I will never forget that to whom much is given, much will be expected," the 49-year-old continued. "And I promise you to do all my powers permit to be a faithful servant of the constitution and laws of this great nation." Trinity Lutheran Church of Columbia v Comer - A Missouri church denied state funding for a playground in a case concerning separation of church and state. Masterpiece Cakeshop v Colorado Civil Rights Commission - A Colorado baker who refused to make a wedding cake for a gay couple. Peruta v San Diego - Does the second amendment grant California gun owners the right to carry a concealed weapon in public places? North Carolina v North Carolina NAACP - A North Carolina voting overhaul that was said to target African Americans "with almost surgical precision". Hernandez v Mesa - The case of a 15-year-old Mexican who was on the Mexican side of the border when he was shot dead in 2010 by a US border patrol agent. President Trump's executive order banning travel from six Muslim-majority countries is also probably heading to the Supreme Court later this year. Mr Gorsuch's appointment to the Supreme Court comes after a year-long political battle over filling the vacant seat. Republican lawmakers refused to consider Barack Obama's nominee to replace Justice Antonin Scalia, a conservative darling who died in February last year. It was the longest period a seat has remained unfilled on the Supreme Court since during the American Civil War in 1862. On Monday morning, Chief Justice John Roberts administered Mr Gorsuch's first oath, which all federal employees take, at a private ceremony at the Supreme Court. All eight justices, Mr Gorsuch's wife and two daughters and Maureen and Eugene Scalia, the widow and son of the justice Gorsuch is replacing, attended the ceremony. Later at the White House, Justice Kennedy administered a second oath to Mr Gorsuch, who was his former law clerk. At one point during Neil Gorsuch's Rose Garden swearing-in ceremony, Donald Trump thanked Senate Majority Leader Mitch McConnell "for all he did to make this achievement possible". The thanks were certainly well earned. Mr McConnell quite possibly did more than any other US senator in history to ensure his party's nominee was confirmed to the Supreme Court. He defied tradition in holding the late Justice Antonin Scalia's seat vacant for nearly a year so Democrat Barack Obama couldn't get his man on the court. He then reversed more than half a century of precedent by abandoning the filibuster rule and allowing Mr Gorsuch a straight majority vote. With Mr Gorsuch on the high court Mr Trump has fulfilled a campaign promise that was instrumental to his election last autumn. The prospect of a liberal majority serving as the final arbiter of legal disputes was terrifying to many hard-core and evangelical conservatives who might have otherwise been reluctant to fall in line behind their party's unorthodox nominee. Instead they voted for Mr Trump in droves - by a larger margin than they did Mitt Romney in 2012. The deal is now done, and the rest of Mr Trump's presidency stretches before him. While the Gorsuch nomination unified Republicans of all stripes, the coming political battles will hardly be as clear-cut - and Mr McConnell may not be the hero for the president that he was today. Mr Gorsuch, a former Denver appeals judge, was confirmed 54-45 on Friday after Senate Republicans took the historic step of changing the chamber's rules in order to ram through their pick. On Thursday, Senate Majority Leader Mitch McConnell triggered a legislative manoeuvre known as the "nuclear option" when Republicans lacked the 60 votes required to end debate on Mr Gorsuch. The result is a triumph for Mr Trump's young presidency. For many of those who voted for him, securing a conservative judge on America's highest court was a top priority. Neil Gorsuch has made it all the way to the hallowed hallways of the Supreme Court. Gorsuch took his official oath to become the ninth justice in a short ceremony Monday morning, before a public ceremony later at the White House. Now, after a lifetime of preparation and several grueling weeks as a nominee, he starts his tenure as the junior-most justice. The new guy. The rookie. Sure, his vote on a dream docket of constitutional and statutory cases will be equal to any other justice. They all wear the same black robes, after all. But someone has to open the doors and lead the cafeteria committee. With no time to catch his breath after meeting with more than 80 senators, enduring 20-plus hours of testimony and watching the Senate go nuclear over his nomination, he'll have to learn quickly. And even though he served as a clerk at the highest court in the early 1990s, he'll still have to adjust to the peculiar place that is the Supreme Court. It's steeped in tradition and seniority weighs heavily. The junior-most justice starts off at the bottom of the heap, sits on a far wing of the bench and speaks last at conference. Indeed, the conference -- the regular closed-door meeting where the justices discuss cases -- has an unusual tradition. Only justices are allowed to attend. No clerks, no assistants, just the nine. And the junior-most justice is assigned the task of answering the door. Seriously. It's a job that Justice Elena Kagan, confirmed to the bench in 2010, is likely relieved to relinquish. She lightheartedly described the job qualifications at a Princeton appearance in 2014. "The junior justice has to answer the door," she began. "I mean literally, if there is a knock on the door, and I don't hear it -- there will not be a single other person who will move, they will just all stare at me until I figure out 'oh, I guess somebody knocked on the door.'" Why might people knock on the door? "It's like 'knock knock, Justice X forgot his glasses' ... 'knock knock, Justice Y forgot her coffee.'" "So there I am popping up and down. I think that is a form of hazing, don't you?" she said to laughter. Besides conference duties, the junior justice is also traditionally assigned to the cafeteria committee. The court is a close-knit place, and staff and a number of the justices divide up into committees dedicated to the functioning of the institution. One lofty assignment -- often doled out to senior justices -- is the budget committee. The cafeteria committee is a decidedly less lofty assignment. Justice Stephen Breyer served there for a near record-breaking 11 years during a stretch when the court's membership didn't change. Gorsuch will have popular shoes to fill. Kagan gained the instant respect of colleagues, clerks and beat journalists when she spearheaded the installation of a frozen yogurt machine. The new job comes with no handbook, no orientation sessions. Other justices in their early days have leaned on their colleagues. Justice Sonia Sotomayor relied upon Justice John Paul Stevens to serve as a mentor in her first several weeks. In 2016, she called him her "barometer" in part because he assured her that it was okay to be a solo voice at times. "He gave me the courage to understand that some things just have to be thought about," she said during an appearance at the University of Wisconsin Law School. Justice Clarence Thomas credited the late Justice Antonin Scalia with helping him learn the ropes. "I can honestly say that as beat up as I was when I got there with the workload, I don't know how I would have gotten through if he hadn't been there," he told an audience hosted by the Federalist Society in 2013. In 2015, Justice Ruth Bader Ginsburg recalled being dismayed about her first opinion assignment in 1993 because it dealt with an impossibly complicated congressional law. She thought her first opinion might be more of a softball. Justice Sandra Day O'Connor came to her rescue with her usual straightforward advice. "Just do it," the first female justice on the bench told the second. When the opinion was released in court, O'Connor slipped her a note, Ginsburg recalled. "This is your first opinion of the court, it is a fine one and I look forward to many more," the note read. And then there's the issue of clerks. Interviews with several former clerks who served for first-time justices reveal that those first few weeks can be daunting. "Justices are appointed so rarely that they are left to figure out things out on their own," said Deborah Merritt, who served as a clerk to O'Connor during her first term. Merritt remembers an unusual situation. She said that O'Connor contacted her first four clerks shortly after her nomination. They were then hired by the chief justice on the court's general payroll to begin preparing memos and materials for the new justice. "When the Senate Judiciary Committee voted to confirm Justice O'Connor, Court officials drove us across town so that we could meet her and deliver the memos we had prepared," Merritt said. After her first conference on argued cases, Merritt said that O'Connor was dazzled. "She described to us how momentous it felt to sit in that historic conference room with just the other eight justices," she said. Alexander "Sasha" Volokh served as a clerk for incoming Justice Samuel Alito. Volokh had been on the court clerking for O'Connor and says he was relieved when Alito asked him to stay on. Alito, a former appellate court judge, knew his way around a legal opinion and oral argument. But different kinds of cases come to the Supreme Court, including the sober responsibility of deciding last-minute death penalty appeals. Volokh explained that each chamber had a clerk that stayed up late to handle any last-minute stay applications. "My first question," Volokh said in an interview, "was 'if we need to wake you up, do we have your standing permission to do so?' Alito said 'yes.'" When Gorsuch arrives, the eight justices might have a few cases lined up that are split 4-4. Peter Keisler clerked for Justice Anthony Kennedy, who faced a similar situation during his first term. "Justice Kennedy arrived at the court in February 1988, during the middle of the term. There were a couple of cases that had already been argued but on which the court was deadlocked 4-4. So the court issued an order directing that those cases be reargued," Keisler remembered. He said that while advocates always try to answer questions as persuasively as possible, he sensed that attorneys gave "special solicitude" to Kennedy during the rearguments, knowing his would be the decisive vote. "Perhaps, in that sense," he said, "those cases were a harbinger of things to come." 0 Response to "Neil Gorsuch Is Sworn In as Supreme Court Justice"